I have always prided myself on being real and honest with you, showing you what the reality of living with vision loss is like. I always want people to see what the possibilities are and that life is not over if you have vision loss. But I also want to be real with people when it comes to the struggles. I have had a really rough couple of days. As many of you know I had some light perception left and that was all the vision I had. I have lost that light perception, and now have nothing left. It was hard to even talk about it, when it happened I was shocked. I have been really struggling, I took comfort in that little bit of light that I saw, Once it was gone I realized how much I used that little bit of light perception. It is hard to explain but seeing that little bit of light for me was a huge comfort in my vision loss because it was something. I have had a lot of emotions going on but the biggest thing for me was fear. I was terrified, I am terrified. I have had my anxiety go through the roof. It is just so overwhelming and hard to describe now that I am trying to put it into words. This morning when I got up, my alarm went off and I went to get ready for work and I just couldn’t do it. There was just too much fear and anxiety and it won. I took a personal day which was probably what I needed in the long run. I kept telling myself all morning that I needed to get up get dressed and go out. Go get a coffee do something, I had to prove to myself I could still do it. I would like to say that that is what I did and it was easy but that is not the case. It took me from 7am to 3pm to be able to convince myself that I could do it and leave the house. There were tears in that route to get coffee and this is a route I have done hundreds of times and know like the back of my hand. But it felt like I was lost and doing it for the first time. My perspective on the world as I knew it has completely changed. There has always been this fear ever since I was young of that day I went totally blind and saw nothing at all. It is a fear I hear so many of my friends talk about and I think we all in the back of our minds think it will never happen to us. And I was one of those, I never thought I would be here writing this. I made it to the store and I got a coffee and it sucked, it was hard, it was emotional and I feel like I have a huge mountain in front of me to climb. It is going to be a rough climb but I will be on top of that mountain soon enough. As you lose vision or your vision changes, each time this happens it can take you right back to day one of it happening. It can bring up all the emotions all over again and it is hard. You literally have to start climbing from the bottom all over again. It is a place that no matter how much support you have around you, that can feel very lonely and terrifying. And this is mostly for me but you can do it. You are stronger than you know. This is just another challenge that you have to figure out and overcome. This challenge that has been put in your path can not defeat you or win. It won’t be easy but it will be worth it! I love a low tech product that really makes a difference. This product is one of those. Band It Identification Bands are so helpful around the house. I use many different ways to identify things when they look the same, like elastic bands, puff paint, placing them in a certain spot. These all work as well but they are not as easy as the Band It bands. I have been trying these out for a few months now and have found them very helpful for not only myself but for my kids as well. It is nice to find a product that works great for me as someone who is blind but also can help my family members who are sighted. Band It Identification Bands are tactile bands that help you to identify things. They each have a different tactile marker on them from diamonds, squares, circles, lines and flat circles. They are also brightly coloured for those that have low vision. They are very flexible and durable which is nice, I found when I was using elastic bands they would wear down and break where as these do not do that. I have been using them in the kitchen, the phot is of two jars that are the same size and shape one is beef bouillon and the other is chicken bouillon I had always struggled to know which one was which quickly. I would have to get out my phone and use an app that would read them for me or ask my kids or husband. Which these I am able to tell the difference just by grabbing the jar which is great. Another use that I have been really enjoying is in the shower with my shampoo and conditioner, with the Band It’s it is easily identified even when everything is wet. One thing that so many have trouble with is cleaning products, I use Method cleaning products and love them but all the bottles are the same shape and size. Now with the bands I am able to put different ones on the cleaners that I want to identify quickly. Here I have it on the window cleaner. I said early that my family is able to use them as well, especially my kids. They have water bottles that are the same and are always trying to remember which one is who’s. Then the fight starts about I put mine there no I put mine there so now we are able to use the Band It’s they can put them where ever they want, and not fight about whose is whose. Technology is amazing but it is really nice to have a product that does not mean I have to have my phone in my hand at all times. These Band It Identification Bands are very helpful and I am happy to have had the opportunity to try these and want to Thank Band It for sending them to me. This past year has been a crazy rides of ups and downs, there were times when I thought this year can disappear anytime now. Then I was reminded that those are the years that are the greatest the ones where you have many ups and downs and you come out on top and make it through. I am always striving for more in my life and to do better and this year as we quietly brought in the new year with my kids and husband, I was reminded that I have goals and things that I want to achieve and that is good but I have to remember to cherish what I have now and what I have accomplished thus far. We tend to compare ourselves to others so readily and easily, social media makes this so easy. But we forget that people don’t often post their struggles and the bad times, they post what makes it look like they have all their sh*t together when in reality they are in just as deep or farther than you. I can find myself getting sucked into the comparison so easily, I see people posting about their hot holidays and automatically think “man I wish I could go on vacation” but the reality is, I hate the heat and don’t have any desire to go on a hot holiday in the winter. Yet when I see these posts I can find myself comparing my “boring” life to others and that is just not what I want to do. The reality is that I have an amazing life, is it boring? You bet, but it is my boring and I love sitting and reading too many books, crocheting and drinking coffee with my kids running around screaming and fighting (maybe I could do without the fighting) and my husband here with me. I enjoy the chaos of going to work everyday and trying to get everything in that I need to and then squeeze in my classes on top of it. Is my blog booming and have millions of followers, nope, is my YouTube channel taking off, nope but that isn’t why I started. I started because I wanted to share my life with people and show them that my life is just as normal as theirs was even though I am blind. 2019 is going to be a great year, there are going to be ups and downs. I don’t do resolutions they have never worked for me in the past and always had something to do with me changing something about me. But this year I am just going to remember to enjoy the ride. I would also like to take the time to thank all of you for your support over the last year. The reason I do this is because of all of you. You are a great community of support for myself and others who are struggling or just trying to get through. so thank you and I hope that your 2019 is fantastic! As my training came to a close I was excited to be on our own and terrified to be on our own. This week was something that was invaluable to me. Danson and I flew home with a trainer from Ottawa and that was amazing. To have someone there with you, to help support you so that if something went wrong you were not alone, was something that I am just so thankful for. It may seem a little weird that I am so thankful for the week of training and someone to accompany me home when I had already qualified as a team with Danson. The thing is that Danson and I did our training in a unfamiliar environment and although we spent 2 weeks together I didn’t know him that well. I did not know how he would react on a flight and in a busy airport. Same with when we got home I had no idea how he would fit in to our home and would he settle in well. There were so many unknowns. Danson was a great flier and he did so well. The sandwich myself and the trainer bought at the Toronto airport for $15 each was not terrific at all but Danson made up for that disgusting sandwich. (I can not express how gross this sandwich was). We had two flights one was an hour and the other was three hours and on both he did really well. Once we landed in our home city and met up with my husband the real work started. Danson was excited to be off the plane and get to go pee. Once we got home he did really well with my three children and seemed to settle in pretty well for the night. The trainer accompanied us to my house to make sure that the first meetings went well and he started to settle. In the morning myself and the trainers did some routes around my home and it felt really good to be in our home area and working. I could feel the freedom and confidence building with each step. The week was full of lots of work with the trainer and my orientation and mobility specialist to make sure that we knew our routes to places like work, my kids school, and some other places I frequent regularly. There were times when I was in my head and felt lost and other times when I felt like I had this and we were rocking it. Having those times when I felt like I was lost and not doing great and questioning everything was such a blessing to have the trainer and my O&M with me, supporting me and reassuring me. As the week came to a close and we were packing a bag to attend our graduation in Toronto and then fly off to a work event in Vancouver I was nervous knowing there were going to be times when it was hard, but I was excited that we had finished it and made it through all of the emotion good and bad together. It is hard to go through such a roller coaster of emotion with a dog and not come out of it feeling like he is truly a part of you. Through the good and the bad he will be there by my side guiding me through it all. 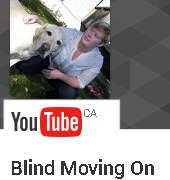 I am beyond grateful for all of the support of the CNIB and the CNIB Guide Dog team. The success of myself and Danson is because of the support that we received along the way. We are now on our own and will be updating you on our adventures as they come, the good the bad and the ugly. And I am sure there will be some of all.